When the new Mac mini and MacBook Air debuted at the end of October, Apple added a list of online stores for an upcoming Blackmagic eGPU Pro. By the time it was first introduced, the new eGPU's list indicated that it would be released late November, but as pointed out 9to5Mac, the list now indicates that the device will not come until December. The Blackmagic eGPU Pro comes with a Radeon RX Vega 56 graphics processor with 8GB of MBM2 memory, two Thunderbolt 3 ports, four USB 3 ports, an HDMI 2.0 port and a DisplayPort 1.4 port. It offers 85W of power delivered. Like the previous Blackmagic non-Pro eGPU, the new version includes an all-in-one aluminum enclosure. 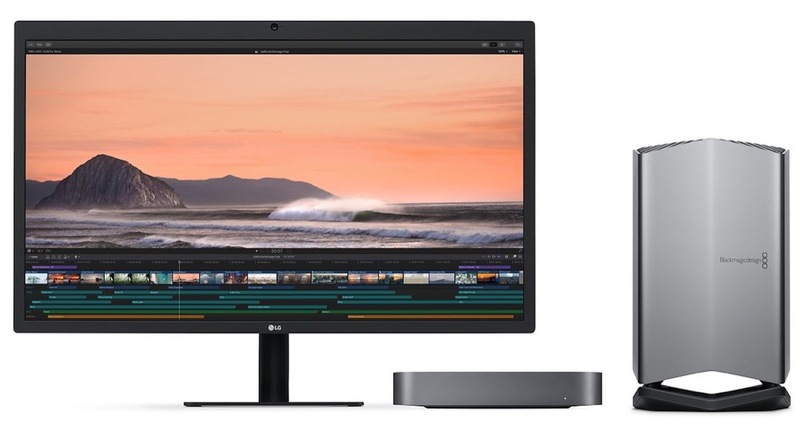 Apple's Thunderbolt 3-compatible Macs, including Mac mini, MacBook Air, and MacBook Pro, work with the Blackmagic eGPU Pro.